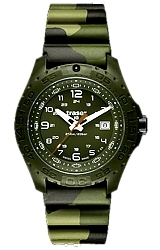 Traser's SOLDIER lightweight Military Watch features a Camouflage designed case and rubber dive strap with a sapphire glass crystal, fiberglass reinforced polymide case and full tritium illumination. In addition to is tough military design, the Traser Soldier is depth tested for water resistance to 660 feet or 200 meters below sea level. 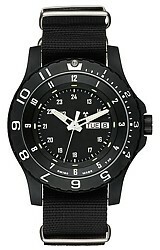 Model 106631 features the camouflage design rubber dive strap.